Difficult is the wrong word. He can’t walk on any hard surface (bamboo floors for example) without shoes and socks on. And since there are many floors (bamboo for example) between the TV viewing room and our room, getting from one to the other can prove daunting. To illustrate – and so you will know I’m not exaggerating – my husband told the TSA airport screeners he could not walk through the line without shoes on. They did not believe him. He took them off, and crawled through security. The reasons he can’t walk are myriad and boring and pity-evoking. So, we won’t go into it here. The point is, I got him a TV for our bedroom for his birthday. Then, I went furniture shopping for the perfect something to rest this TV upon. Guys! 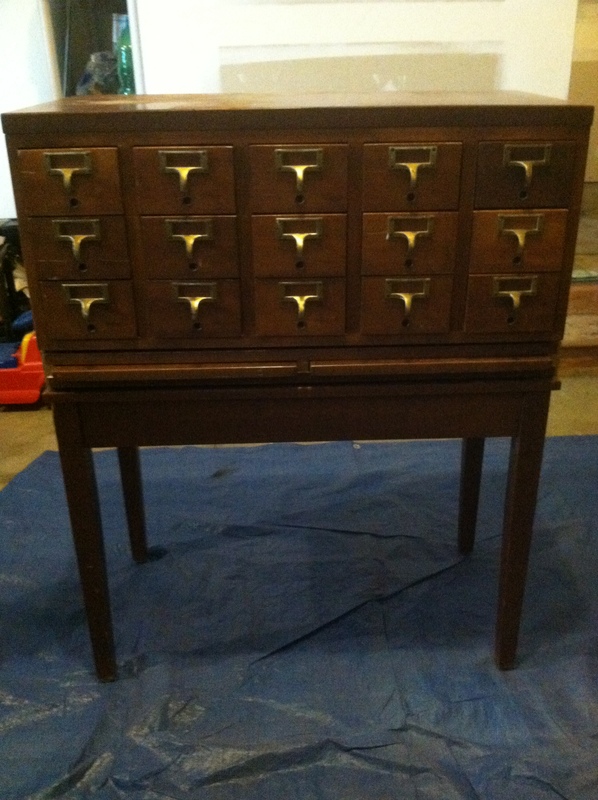 It’s an antique library card catalog. If ever there was a piece of furniture with my name on it, it is this. Look close, there on the leg – mm hmm – there – see? my name! 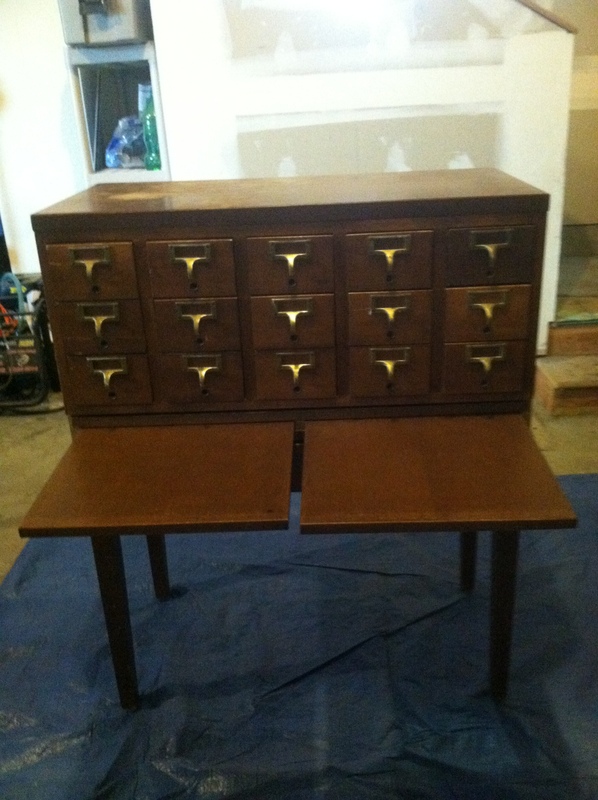 It’s furniture about BOOKS! I am so hopelessly gonzo for it. Swoony right? I’m using her to store my scarves for now. Every morning I wake up to her face, I am a happy, geeked out girl. I just try to ignore the beast that sits atop. P.S. The painting? Turns out I’m getting better at it. No paint spilling incidents and only two trips to the paint store (and this time not because I made mistakes but because I custom ordered the paint to match my throw pillows). P.P.S. You got me! No. TV in the bedroom was not my number one marriage rule. I exaggerated for effect! But it is in my top ten rules – up there with never saying the “D” word, ALWAYS closing the bathroom door, and never going to bed without ice cream. P.P.P.S. Reading. Reading is what we do in the bedroom.